The tradition of cutting the wedding cake represents a special moment at your wedding. This ceremony is intended to show the commitment of your union. Did you know that there is actually a method on how the cake cutting should be done? During the cake cutting, the bride holds the cake cutting knife in her hands and the groom’s hand then holds the bride’s as they make the first cut together. 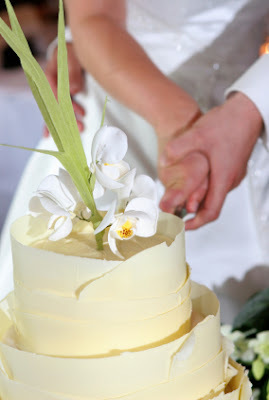 The reason the bride's hands are placed on the knife first is because the cake is a symbol of fertility and prosperity and the direct connection with the bride should not be broken. This tradition started long ago with the bride actually serving the cake to the wedding guests. It has since evolved into the bride and groom cutting the cake together, sharing the first piece with each other, and making a toast to their guests to thank them for sharing in the celebration.The reception venue or caterer generally cuts the remainder of the cake and serves it to the guests. You want to make sure the moment is perfectly captured when you cut the cake. When planning the setup of your reception venue, be sure the cake table is setup in a well lighted area or have your DJ enhance it with a spotlight. You also want to be certain your photographer and DJ know exactly when the ceremony will take place. Your DJ should announce to your reception crowd that the cake cutting ceremony is taking place and give your guests plenty of time to gather around the table. Have your photographer take several "before" shots of the cake ... and then have them ready for the cutting, sharing, and toast portion of the ceremony! Whether you politely eat the cake as a couple or mash it into each others mouths (don’t forget about the hard work your lovely bride did with her makeup), have fun with this long standing wedding tradition. We suggest you have a conversation before the wedding about your plans for the cake sharing ... this will help avoid unwelcome, messy surprises. 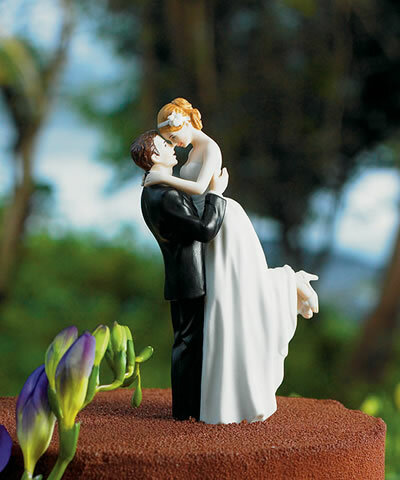 Cake Toppers add to the uniqueness of each couple’s commitment. The traditional wedding cake topper often shows the couple in formal attire…but they can also represent hobbies, shared interests, humor or an unusual theme. This is a perfect way to bring your personality to the cake for everyone to see. 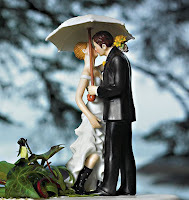 Pick a cake topper that is representative of who you are and have some fun with it! If you are using fresh flowers on the cake, you can still have a cake topper set off to the side of the cake. 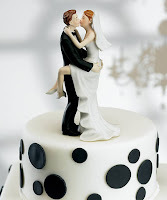 It serves as decor at the cake table and still enables you to share some of your personality with the wedding cake. Preserving the top tier of the wedding cake has been part of the wedding tradition for centuries. Often couples will open the cake package on their first anniversary and enjoy another taste as part of their celebration. If this is something you plan to do, make sure to have an airtight plastic bag or box ready to store the top tier of the cake. It helps if the top tier is frozen briefly before being wrapped with wax paper and placed into the airtight container. For best results, it should be placed in a freezer right away.